Hand Crafted Leather products are hand stitched using USA tanned leather. Leather bags, tool-belts, and aprons are available. Women creating for women is something we are extremely passionate about doing. These beautiful hand-made leather pieces were created by my wonderful friend and her children. She is a busy working mother that wants to model for her children how to persevere as a working mom that has an entrepreneur's heart. The love for her craft can be seen in the detail and quality of her leather work. Each line has a certain number of pieces that will be created by Farm Hand Made Co., making them not only unique but limited. Hand-stitched, handmade here in Indiana from our friends at Farm Hand Made Co. 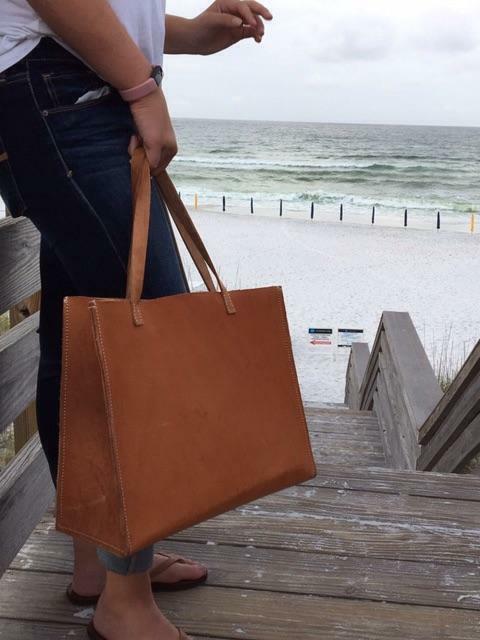 These market totes measure 12"x17"x6" with an 8" handle drop - are constructed with heavy 8oz leather and tanned in the sun. The Endless Summer collection is offered exclusively here at Reclaimed. Lisa and I collaborated to create a tool-belt/garden belt fit for women. It can be custom made for your right or left hip, has a ring in the middle back and the buckle is offset just to the side for the ultimate fit and comfort. These can be made with a natural leather or our exclusive Made in America Wicket & Craig brown veg-tanned leather. These are made with a sturdy 8 oz leather and will be hand-stitched and riveted for long-lasting durability. Thread colors come in a beige, dark brown, turquoise and vibrant blue. You will be surprised how much you love this belt and wonder how you ever lived without one, or at least will always know where your marking pencil and cutting shears are at all times! thanks for supporting local, rural makers.